In last post TIP #91 we talked about What is Data compression ? What are the features ? 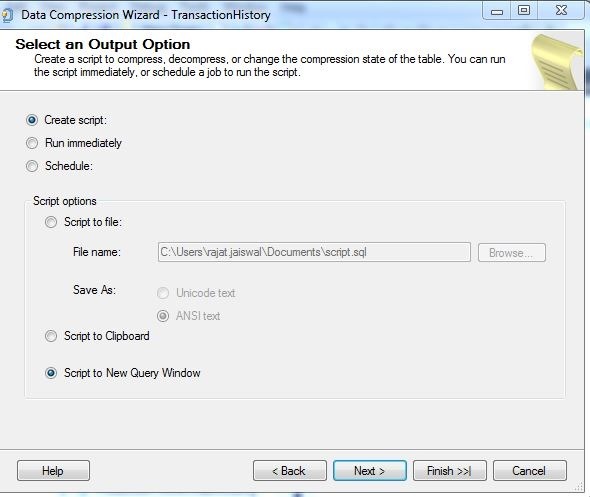 Now in this tip we will take implement the data compression with basic steps. 2) Once you click on the above option you will get following screen. Now you can generate the script for this compression type. We can directly run the script on database itself if we are sure which with compression type. 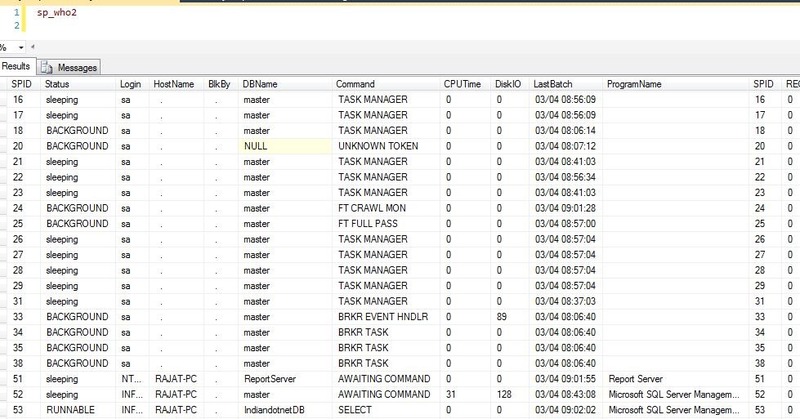 Once we run the above command on database we are good to go and our table is compressed. I hope this steps will help you to compress our database tables. A part from performance many times we faced challenges related to space of our database. Sometimes our database is actually taking huge space and sometimes it our mistake due to which it took space. It is worst condition when you are on a dedicated hosting or cloud hosting with limited space. In such case “Compression” is one of the best option. This feature introduce in SQL SERVER 2008 onwards with Enterprise & Developer Edition. By the name it is clear that it compress the data and provide more space on disk. Row level compression primarily turns fixed-length data-types into variable data-types, thereby saving space. It also ignores zero and null values saving additional space. Because of this, more number of rows can be accommodated in a single data page. Page level compression initially performs Row Level compression and adds two additional compression features – Prefix and Dictionary Compression. Page level compression offers better space saving than row level compression. Although the page level compression produce more space but obvious the CPU utilization is higher in page level compression. Overall we can say the page level compression is highly CPU consuming operation means it involves lot of CPU efforts for compress & de compression. So choosing this option requires a high CPU & RAM configuration machine. Due to this feature it mostly used in data warehouse database where repeated values occurs. using this option with a table where lots of write operation occurs in day to day activity will be a bad idea. 1) Data compression is SQL SERVER feature so we don’t need to do any tweak or rewrite our application code which is a good thing. 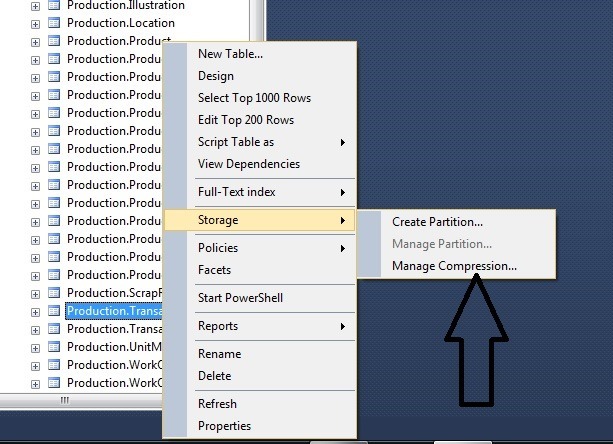 2) Compression is real time so again you don’t need to re run a maintenance job each time to compress the data. 3) As mention earlier you have to pay bit CPU cost for compression. 4) with Compression data files MDF files, ldf files and buffer cache size can be improve. 5) Compression not compress FILESTREAM data object which is obvious. 6) Although maintenance of compressed index is higher. In next post I will show simple steps for implementing this best feature. In my last article (TIP 87) I wrote about PWDENCRYPT. I forgot to write few details but thanks to all my talented friends & blog readers who guided me by providing there feedback on post. I respect their inputs and always interested to get more inputs. Thanks to all of you. 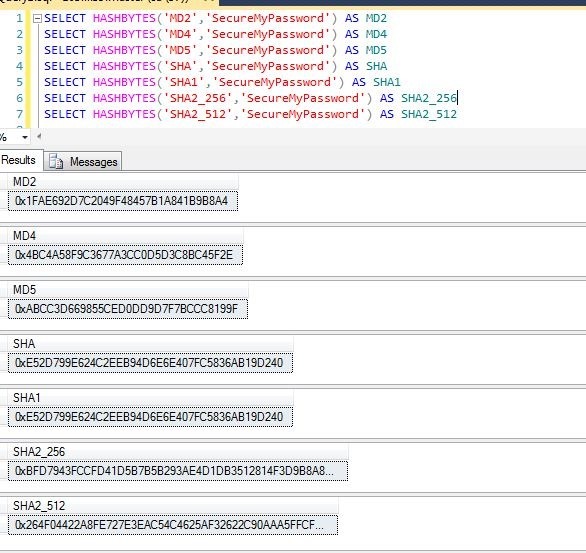 Now I would like to share information about “HASHBYTES” function which is also available for secure your password using various Hash algorithms like MD2 , MD4 , MD5 , SHA ,SHA1 , SHA2_256 , SHA2_512. The PWDENCRYPT can be use but HASHBYTES function provides you various options to make your content robust secure. Just wanted to add here that SHA2_256, SHA2_512 available with 2012 version and above. Now we have different algorithm then which one we have to use so the answer is (according to my knowledge) use the latest most secure one Like SHA1, SHA2 etc. I hope this article may be useful to you.